Have you ever encountered on the road a painting, which you think it is a real person or a real object moving in front of your eyes? If so, you have seen a 3D picture painted on the wall or on the road of a street. 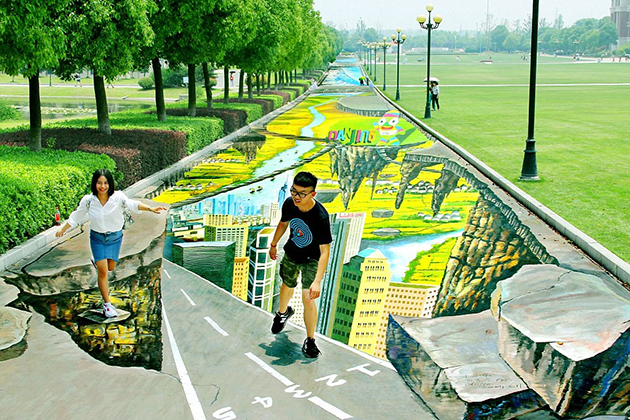 3D street painting is a very new kind of painting in Vietnam, but it is quite familiar in the world for hundreds of years. 3D painting is a kind of painting using the light reflection, color and the artist’s way of shaping to deceive the viewer’s eyes from all angles. It is characterized by its vivid, prominent and passive patterns and drawings, giving viewers the illusion of a real thing going on. It could be an ugly, worrying scene like a fire, a broken building, a deep hole, a shipwreck, … or it could also be a beautiful and peaceful landscape like a pond with blooming lotuses, a winding river, a lush forest. Everything is so real as if we could touch them. The 3D street painting has emerged since ancient Greece, when the artist Zeuxius, born in 464 BC, painted a picture of fruits so lively that birds fly dissect. However, it was not until the 16th century, thanks to the works of Italian Renaissance artists and French painter Tromple I’oeil, that in French means visual deception, used to decorate the wall of the luxurious villa, this type of painting was officially known. In the 19th century, it was innovated on new topics by British artists. Instead of just drawing divine characters, they began to exploit nature or social. From that, the name of modern street paintings appeared. But it must be nearly 100 years later since 1982, 3D street painting has really reached the level of sophistication with the colors and shapes giving the magic illusion of a living entity. That invention belongs to Kurt Wenner – an American painter, formerly a NASA illustrator and master of surrealism. He was the first to devise a three-dimensional technique and took this style around the world. What makes 3D painting unique? 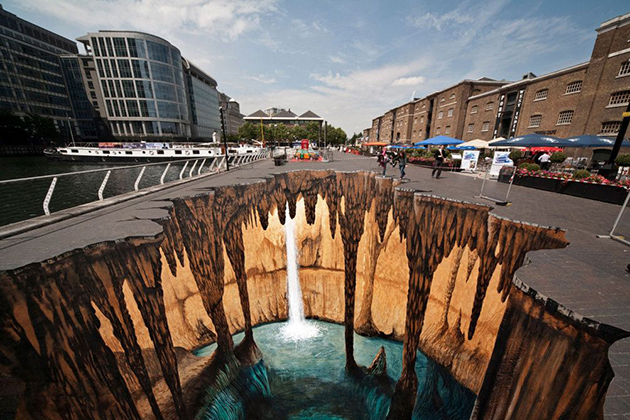 3D street paintings attract the viewer by their splendor, surprise and humor. Each work is usually large, cover the road or the wall. 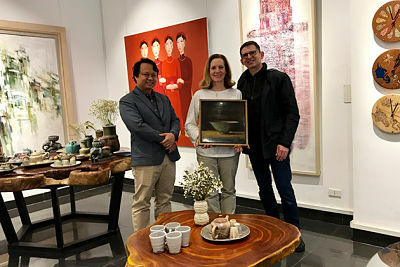 In terms of content, it can be anything of the daily life and the dream: landscapes, cultural activities, ancient stories, movies,… Each artist has their own unique artworks depend on the style and theme they choose. Some artists specialize in drawing streams, waterfalls, jungles, birds,…represent the wonders of the world. Others paint scenes of fire, meltdown, collapse,…denote the danger. Some draw the gods, planets, spaceships, hybrids or text with complex characters, numbers that imply mysterious things. When watching 3D paintings, people always feel relaxed and happy. 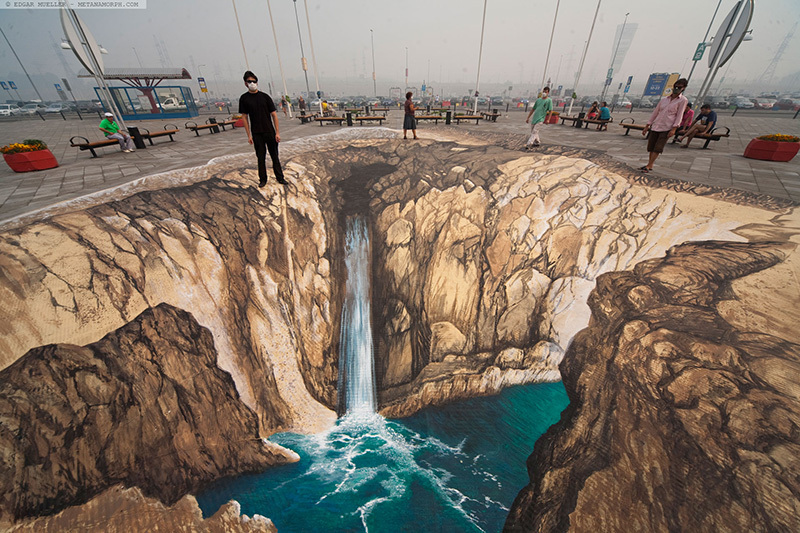 Therefore, 3D street painting is an entertaining and performing art. This type of painting is also for free display and various purposes that do not affect the politics such as street decoration, branding and travel. 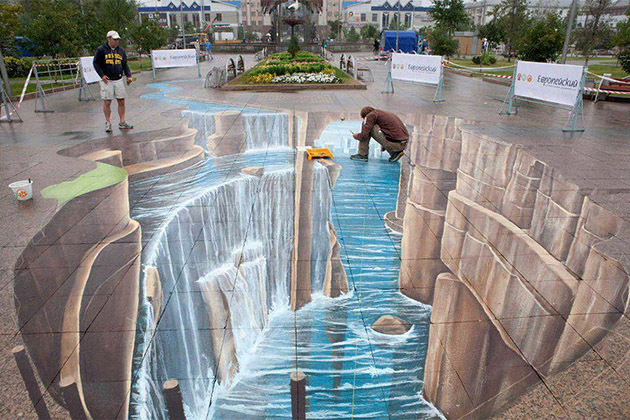 Because of being painted with chalk, 3D paintings usually have the short lifespan and be blurred after the rain. In order to preserve the paintings. Nowadays, in addition to the road, many artists choose to compose indoors, where there are roof and glass. How to make a 3D painting? 3D painting requires the elaboration and accuracy. It takes hours and days to make a picture. In order to make them quickly, they often have to use a variety of techniques, including paper sketch, computer as well as having samples and models for comparison. Once the 3D projection of the object is determined, it will be applied on the wall or the ground. There is a rule as follows: The closer the painting is to the horizon, the more space it occupies. However, due to the limited area of the street or the wall, the artist has to take advantage of each area assigned in order to convey interesting content, erasing the boundary between the real and the unreal. Usually, a work is composed by a composer, but because of its complexity, it is sometimes a product of the collective. Artist Edgar Mueller created a cave right on the street with incredible sharpness and authenticity. This is one of the most highly rated 3D artworks today. The cave in Ptuj (Slovenia) always get the admiration from the passer-by. 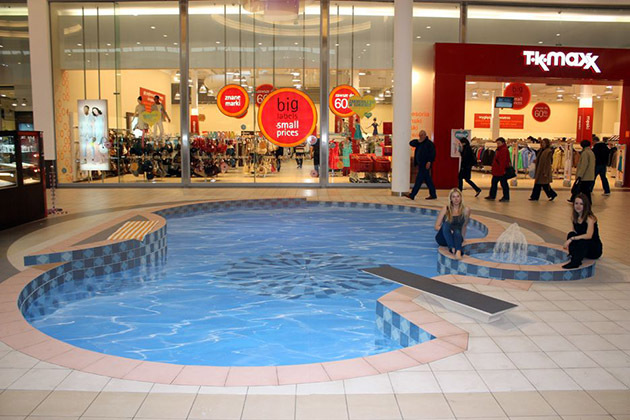 The “swimming pool” in the middle of a commercial center in Poland is made by talented artist Manfred Stader. This work is so lively that even customers come here for shopping want to jump into the pool. The artwork named “Rhythm of Youth” was created by a group of Chinese artists led by Yang Yongchun. It is located in Nanjing city, Jiangsu Province, China. The group of artists used a ton of paint and 2 tons of fabric to complete the unique work. The artists planned to create the work in 6 months but they completed it in 20 days with the collaboration of 20 artists.